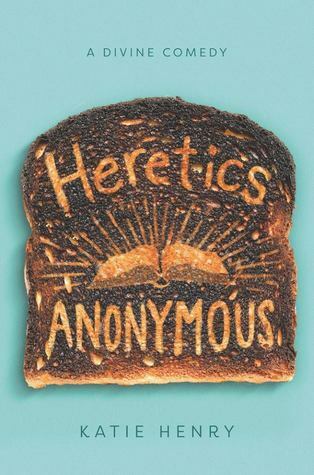 I’ve seen Heretics Anonymous discussed/recommended on Twitter a few times in the past week or so, which makes me happy, because I enjoyed it a lot, but I’ve been utterly useless about promoting it to anyone. Except to my flatmate, to whom I read all the quotes that made me laugh, then told her she needed to read the book when it came out because I think she’ll relate hard to one of the characters. Well, it comes out TOMORROW, which is probably TODAY by the time some of you read this post because who actually reads blog posts straight away? So now is your chance. (Or if you ARE remarkably efficient, tomorrow is your chance. But yunno. SOON.) Go! Buy this book! Laugh and have feelings! Oh, wait. I should probably actually tell you why you should read it, shouldn’t I. Whoops. I was a little bit worried about this book. It features a bunch of characters in a Catholic school reacting against its teachings, and I knew, from the blurb, that there were several ways that could go — and some of them wouldn’t have been enjoyable to read. Though I’ll be the first to admit my faith is shaky if not non-existent these days, I grew up in the church, and I was worried it would take a disrespectful approach to religion, with an atheist narrator seeing his viewpoint as superior to those of foolish believers. Then I saw the author tweeting about faith in a way that made me think that wasn’t the angle she was going to take, and I remembered that I had an ARC hanging around (from Edelweiss this time), so gave it a try. It turned out to be the furthest thing from disrespectful, and I enjoyed it a lot. At the heart of what I liked about it was the character of Lucy. The narrator does kind of start out as the atheist who things his viewpoint is superior to religious ‘sheeple’ — but he learns his lesson. What follows is a deep, meaningful examination of faith and the way it doesn’t necessarily mean blind obedience to religion, and how sometimes the urge to disobey religious rules comes not from disbelief but from firm faith. There were several wonderful quotes about finding meaning in different approaches to religion — and central to all of this was Lucy. Lucy is the Catholic among the ‘Heretics’. She’s so Catholic that she wants to be a priest, except she can’t, because she’s a girl, which is where a lot of her anger comes from. This is where she reminded me of my flatmate, who has talked in the past about how the church’s problems aren’t something you solve by turning your back on it. The first time we meet Lucy, she’s arguing with her history teacher about whether or not saints were well-behaved. Spoiler alert: they weren’t. It was a great way to meet her, because I immediately knew I was going to like her. The other characters are interesting enough, but none captured my attention in quite the same way that Lucy did. Eden is a Celtic Reconstructionist Polytheist which was… interesting. I was definitely inclined to prejudge that, and the book’s message was very much that I shouldn’t, but at the same time, I literally just did a degree in medieval Irish and one of the central ideas we discussed over and over again is the impossibility of reconstructing a Celtic pantheon because we have no record of it other than from a highly Christian milieu several hundred years after paganism had all but gone from Ireland. As a result, it’s a branch of paganism I find extremely difficult to understand (drawing on Greek and Roman stuff makes more sense to me; at least we know their gods *were* gods and *were* worshipped, and even how that worked). But I try not to get between people and the things they find meaningful, because that’s up to them, and I think that’s what the book was trying to express. Avi is Jewish and gay, so you can imagine how *he* feels about the school, though I didn’t feel he actually got enough screentime to really explore the nuances of his personality. I wasn’t particularly invested in Max, I have to admit, though he wasn’t, like, objectionable. The book is also funny, and I think there are parts of it I found extra funny because of my own experiences. I didn’t go to a Catholic school, or even a Christian school at all; my church growing up was an extremely ‘low’ Church with very little ritual and as a result I find all of that stuff deeply confusing. But I still grew up with faith, which I think helps. I also did a degree in medieval stuff, so I know way too much about saints and how weird they are. I think my position there is closest to Michael’s (the atheist narrator): I didn’t grow up believing in saints, so I’m free to enjoy them as deeply, deeply odd stories. Here are a few of my favourite quotes, with the caveat that they’re from an ARC and may not match the final edition and so on and so forth. I think they summarise the things I liked about it, both the humour and the ideology.